The GE U18B diesel-electric locomotive was introduced by GE Transportation as a branch line roadswitcher in 1973. Easy to spot due to its relatively short length — 54 ft 8 in (16.66 m) — it was the only North American locomotive powered by the 8-cylinder 7FDL engine. The Seaboard Coast Line Railroad (SCL) bought 105 U18Bs, far more than the second-best U.S. customer, the Maine Central Railroad (MEC), which ordered 10. Most of the SCL and MEC U18Bs rode on refurbished Blomberg trucks, recycled from old EMD locomotives, making the U18B even more visually distinct from other GE locomotives. Many railfans refer to the GE Universal Series locomotives as "U-Boats." Due to its smaller size, the U18B received the nickname "Baby Boat." 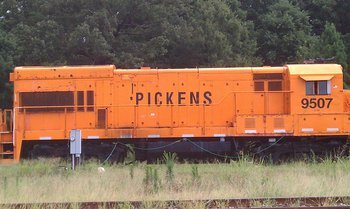 Not many U18Bs still exist, but some short-line railroads, such as the Pickens Railway, still have several U18Bs in everyday service. GE included information about a B18-7 locomotive (which would have followed the U18B) in its 1978 "Series-7 Road Locomotives" service manual, but none of these updated units were ordered, sold, or built. This is a functional tested version of a project using individual sound recordings for each prime mover notch setting. These prime mover sounds can be played in three modes determined by CV155: automatic, semi-automatic and manual notching. In auto mode, the prime mover notch is determined by the current speed setting, and is adjustable using CV132. In semi-auto mode, the same is true but it is possible to "throttle up" to higher notches using F11 and F7, if you want your engine to sound like it is working harder. Manual mode offers full control of the notch setting using F11 and F7, so you can throttle down to idle and turn on dynamic braking while coasting downgrade. This sound project has been assembled from Digitrax-supplied sound clips as well as new sounds from custom recordings. Thanks are due to Alex Stroshane, Fred Miller, Bob Grosh, Jim Walton and A.J. Ireland for their prior work in developing sound projects. This is the Sound Definition Language (SDL) file for a project that can be used for a typical diesel locomotive with 8 throttle notches. Coding based on previous work by Fred Miller, Bob Grosh and Jim Walton using the SDL format developed by A.J. Ireland and Digitrax. Prime mover sound files were provided by Ted Alan Najzer.